The following review contains minor spoilers for The Secret World of Arrietty and the novel The Borrowers. Also, although the names are somewhat different in the original Japanese, since I saw this as an English dub, I’m going to use the English names. My daughter loves Miyazaki films. Her favorite movie is Ponyo, and she loves My Neighbor Totoro as well. On Friday*, Miyazaki’s latest presentation to American audiences hit theaters. It’s The Secret World of Arrietty, based on the Mary Norton novel The Borrowers. Arrietty was released in Japan in 2010 and grossed the U.S. equivalent of $23 million. It runs 94 minutes; there is no coda once the video behind the credits fades to black. I’ve never read The Borrowers, although I think I may have seen the 1973 Hallmark Hall of Fame version. Still, I knew the gist of the story: tiny people that live in the crawlspaces and under the floorboards borrow things that humans won’t miss, and if they are seen by humans, bad things happen. The Studio Ghibli adaptation of the novel, written by Miyazaki and Keiko Niwa, remains relatively faithful to the novel: a young man named Shawn visits the country home where his parents grew up; he’s there because he’s soon to have heart surgery, and he needs to rest. While there, he catches a glimpse of a tiny girl being chased by the family cat, Nina. The tiny girl is Arrietty, a borrower just on the cusp of maturity (fourteen). Arrietty goes on her first borrowing with her father, Pod, but just before she can borrow a tissue, Shawn wakes up and sees her (but not her father). She escapes, and while her father doesn’t hold it against her, Shawn’s curiosity is piqued and he continues to try and see Arrietty again. As with Totoro and Ponyo, Miyazaki’s writing is most definitely age-appropriate: Shawn and Arrietty say the kinds of things kids their age would say, and they behave in the correct fashions. This particular film is set in a contemporary Japan, as evidenced by the delivery-man using a cellphone and the exterminator (I believe) using a tablet PC**. However, the country home belonging to Hara is definitely old-world — the appliances are serviceable, but probably belong in the latter half of the 20th century (especially the refrigerator, made by the S M E G corporation), even if there’s some Corn Soup that looks an awful lot like Campbell’s. It’s interesting to me that, if the setting is contemporary, why doesn’t Shawn have a mobile phone, but perhaps it’s part of his family’s “get back to nature and rest before your surgery” strategy. Shawn seems content to lie in bed and read, or relax out in the meadow with the cat. The setting is wonderfully detailed, from the “if you’ve seen any anime, you’ve seen and heard this” kind of meadow to the items cluttering up Hara’s house. Plus, the world of the borrowers is fully-imagined, with all sorts of stairs and walkways in the inner walls and floorboard areas of the house. Arrietty’s home is full of the kind of things you’d expect a home owned by tiny people to have, and they’ve even hung photos of the seaside outside the windows to make the place look more attractive. Arrietty’s bedroom is full of greenery, which is an interesting choice but doesn’t get called back as the character progresses — it’s more like “oh, she likes green stuff”, not “she has a special relationship with nature”. Character design was pretty much “standard Miyazaki” — Shawn looked like Sasuke from Ponyo, Arrietty looked like the princess in Mononoke, Spiller looked like Mei from Totoro, and so on. My daughter kept trying to reconcile the appearances of Shawn and Sasuke, actually making up stories about Sasuke being grown up and hiding from someone or something. I was less impressed with the music in this film than I’ve heard in other Miyazaki endeavors. Joe Hisaishi isn’t the composer; instead, it’s French composer Cecile Corbel. Corbel sings throughout the film, although Bridgit Mendler (the actress who plays Arrietty in the dub) performs one of the songs. The music didn’t stick with me, and didn’t seem to have a major hook to it in the same way that Totoro and Princess Mononoke did. The voice acting was average for a dubbed Miyazaki film. Mendler and David Henrie (as Shawn) did a fine job in their roles, although Henrie had less to do because he really could only emote a few different ways. He had to sound tired and weak all the time, which can limit the emotion in a performance. Amy Poehler and Will Arnett play Arrietty’s parents, Homily and Pod (respectively), and again the female in the pair got the lion’s share of the work. Poehler was better than Tina Fey was in Ponyo, while Arnett mostly just had to grunt and speak in a soft and fatherly fashion. Carol Burnett was the “venerable actor” cast in the film — think Pat Carroll in Totoro or Betty White in Ponyo — but her character, Hara (Haru in the Japanese script), is very much a caricature, overblown and excitable, and while I heard traces of Miss Hannigan, I didn’t hear anything special out of Burnett. When it comes to the plot, the only place I felt the film really stumbled was when Shawn and Arrietty discuss death: Shawn has come to terms with the fact that his heart condition could kill him, while Arrietty is afraid of the death of the borrowers as a whole. I kept wondering when the scene was going to end. It was well-written, and a good exploration of how children deal with the foreknowledge and reality of death, but it was very slow and didn’t work amid the rest of the film. 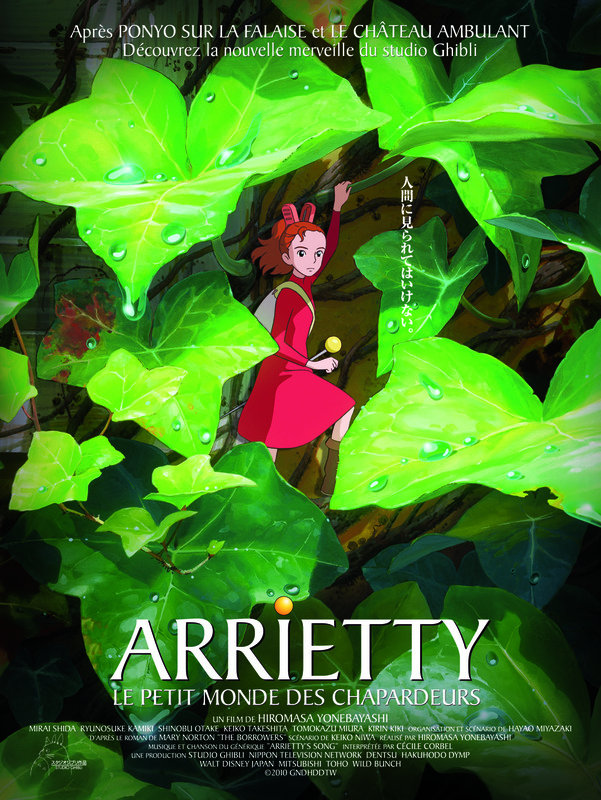 Overall, I found The Secret World of Arrietty to be a good film for kids. It’s not too violent, there’s no on-screen death, the subject matter is age-appropriate, and the good guys win (mostly because there really aren’t any bad guys of note other than Hara, and she’s not too malicious). The ending is a little sad, and I felt like it could use a little more than what we got, but my daughter was fine with it. She told me afterward that she enjoyed the film, and wanted me to get it on Netflix. So, y’know, if the word of a five-and-a-half-year-old is good enough to make you go see a movie, there you are. But if you’re an adult who likes anime, I’d wait on this one; it’s not worth the cost of a movie ticket, not these days. From an adult perspective, it was just too average to wow me. Note to Parents: This film is rated G. There is nothing objectionable, other than the existence of tiny people living in the walls of an old house. So, if magic and/or homunculi are your hot-button issues, you’ll probably want to skip the movie. Of course, you should use your own discretion when it comes to your children. * The film was released to US audiences on 2/17/12, and I’m writing this on 2/18/12. ** It may have simply been a clipboard; it was only on screen for a few seconds, and rarely were those seconds consecutive. About a year ago, I started hearing buzz about a Japanese animated film called Ponyo. I knew it was directed by Hayao Miyazaki, known in the U.S. for, among other things, “Nausicaa: Valley of the Wind”, “My Neighbor Totoro”, “Spirited Away”, and “Princess Mononoke”. My first exposure to Miyazaki was with “Mononoke”, and while I enjoyed the animation and the story, the ending threw me a bit. Then, later, when I saw “Spirited Away”, I felt the same — mostly starting when the main character took the train away from where she was working. But then I heard people saying that the first 20 minutes or so of “Ponyo” made no sense, and were just beautifully-drawn sea scenes. So I mentally shelved it and figured I’d come back to it at some point. Enter Netflix, which I just subscribed to. Netflix, which had “Ponyo” in HD. Well, one Saturday night, my daughter wanted to watch a movie, so I suggested “Ponyo” — it was age-appropriate, and contained nothing more objectionable than occasional scary images (according to what I read before showing it to her). We had dinner, settled in, and began to watch. She was hooked. Completely captivated. And so was I. 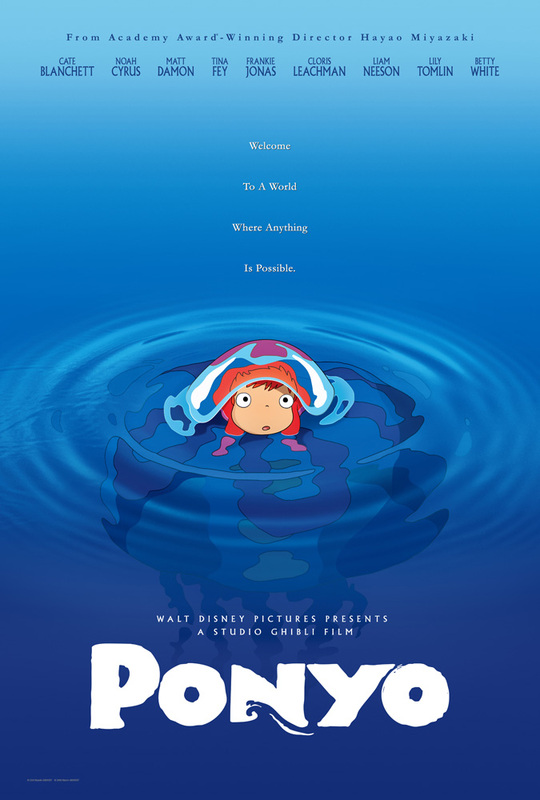 “Ponyo” is a riff on the classic “Little Mermaid” tale of the fish who wants to be human. However, in this story, the fish who wants to be human is the half-human-half-fish daughter of a human sorcerer and the goddess of mercy. While exploring the sea near a Japanese harbor town, she is caught up in a net that is dredging the sea bottom, cleaning up trash, and eventually washes up in the shallows near the home of five-year-old Sosuke. Sosuke saves her from the glass bottle that’s got her trapped, and there he names her Ponyo (her given name is Brunhilde). Later, Sosuke takes Ponyo to his school, shows her to his friends and the old women next door (his school is beside a Senior Center, where his mother works), and eventually loses her to the sea when her father uses magic to retrieve her. And then it gets weird. Because, you see, Ponyo has fallen in love with Sosuke and will do anything to be with him, including defying her father, stealing his magic elixirs, and transforming into a human girl. In doing so, she creates a massive storm which nearly washes Sosuke’s mother’s car off the road and ends up submerging the entire town in what is some of the coolest artwork I’ve seen in anime lately. Because “Ponyo” is directed at children, you know the ending will be happy. But there’s plenty of adventure to be had, lots of humor — once Ponyo gets to Sosuke’s house, there’s several moments my daughter and I both LOL’d at — and and ending that, while somewhat neatly-wrapped-up (what about all those flooded houses and shops? ), is still satisfying. The artwork in “Ponyo” is beautiful, as befits a Miyazaki film, and you really feel like you’re in that harbor town with Sosuke. The mother, Lisa, is somewhat cliched (think Misato Katsuragi at her most stressed-out), but she’s a good character nonetheless. The seniors with whom she works provide plenty of comic relief, as does some of what Ponyo’s father gets up to. And then, when the town is submerged, the adventure Sosuke and Ponyo go on is quite a cool sequence. Because the film was made by a Japanese studio and written by a Japanese writer, there are some things the characters do that don’t track. It’s hard to explain to my four-year-old why Sosuke’s mother is leaving him alone for the night — from what I know of Japanese culture, kids are a bit more self-sufficient than American kids of the same age, but still, Sosuke is only five — and the food they eat is very different from what she has in the morning. I mean, I’ve never given my daughter a ham sandwich for breakfast*. She also didn’t understand the supermarket, and I don’t think she comprehended that the reason none of the letters looked familiar was because it was another language. But these are small things. The voice acting was probably the weakest part of the film, at least for me. Tina Fey didn’t do a very good job as Lisa, and the girl who played Ponyo (the youngest Cyrus sister) had a very annoying voice. Of course, that was part of her character, but still… annoying. The youngest Jonas brother played Sosuke, and he was all right. Liam Neeson played Ponyo’s father, and while he sounded mostly like a put-upon Irish father, that really wasn’t right for the role — despite the character’s appearance. The best voice acting by far was done by the women who played the ladies at the senior center — Betty White and Lily Tomlin. If you’re a Miyazaki completist, or you want to see a really beautifully-drawn film, I’d say you should watch “Ponyo”. Your younger kids will like it, and older ones will sit through it without too much difficulty. At least, the first time. I liked it for the artwork, and for its humor. But overall, I don’t think it was as strong as some of Miyazaki’s other films, despite the strength of Sosuke’s character and the way he sees the world he lives in. In some ways the hyperactivity of Ponyo’s character and viewpoint actually detract from the story as a whole, and it’s at its best when Sosuke is the center of attention. Still, I’d say it deserves most of the praise it’s received, despite my problems with it. If you’re a kid, it probably gets four stars (out of four). My daughter certainly considers it her new favorite, and loves to sing the theme song. But for adult audiences, I’d consider it a three-star film. * Actually, we keep kosher, so she’ll never have one anyway, but it’s the principle of the thing.